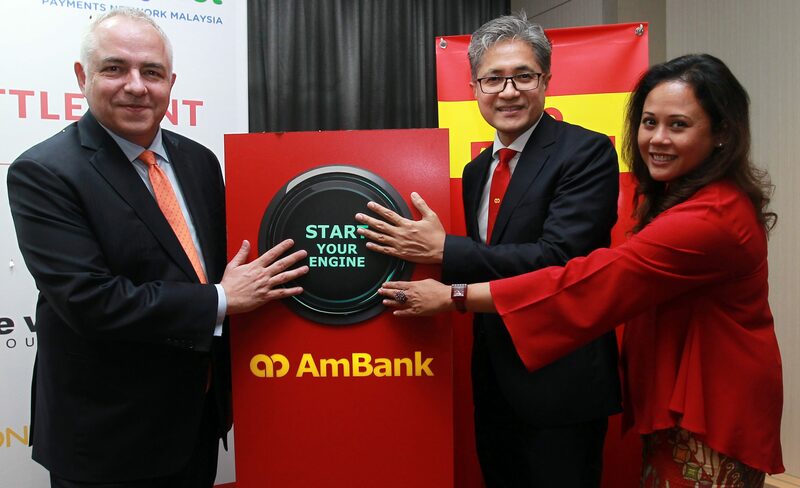 Payments Network Malaysia Sdn Bhd (PayNet) has appointed AmBank (M) Berhad as the cash management bank for its Direct Merchant Settlement (DMS) services. From left – Peter Schiesser, Group Chief Executive Officer, PayNet, Dato’ Sulaiman Mohd Tahir, Group Chief Executive Officer, AmBank Group and Raja Teh Maimunah Raja Abdul Aziz, Managing Director, Wholesale Banking Coverage, AmBank Group at the media launch of Direct Merchant Settlement held at VE Hotel & Residence in Bangsar South on 3 October 2018. Payments Network Malaysia Sdn Bhd (PayNet) has appointed AmBank (M) Berhad as the cash management bank for its Direct Merchant Settlement (DMS) services. DMS is made possible using AmBank’s Electronic Invoice Presentment and Payment (EIPP) system. Additionally, DMS has improved both PayNet and acquirers’ risk monitoring through thresholds and alert mechanisms. Besides benefiting the merchant, PayNet will be able to complement the acquirers’ own risk monitoring by setting daily merchant crediting thresholds and alert the acquirers should an abnormally large amount is detected. Over time, both PayNet and acquirers would be able to build a pattern of merchant payment proceeds, and unusual deviations from these patterns can be flagged for review and investigation. The official launch ceremony was held today at VE Hotel and Residence, Bangsar South with the presence of Dato’ Sulaiman Mohd Tahir, Group Chief Executive Officer, AmBank Group, Peter Schiesser, Group Chief Executive Officer, PayNet, Raja Teh Maimunah Raja Abdul Aziz, Managing Director, Wholesale Banking Coverage, AmBank Group, Ho Chee Mun, Acting Head of Transaction Banking, AmBank Group along with the senior management of AmBank Group and PayNet. “I would like to congratulate PayNet for introducing DMS which allows them to centrally manage TPA payments to merchants and at the same time enhances merchants’ collections process. AmBank is delighted to have been appointed as the sole cash management bank for DMS,” said Dato’ Sulaiman. “We are extremely pleased to collaborate with PayNet to successfully integrate AmBank’s corporate banking solution with DMS to provide an efficient, cost-effective and highly automated cash management and transaction banking services,” added Dato’ Sulaiman. The TPAs under the DMS programme are ManagePay Services Sdn Bhd, Mobility One Sdn Bhd, MOLPAY Sdn Bhd, Revenue Harvest Sdn Bhd, Revenue Solution Sdn Bhd, Ipay88 Sdn Bhd, GHL CardPay Sdn Bhd and GHL ePayments Sdn Bhd.